Your tasks earn you victory points. The more you comply with the specific project budgets and priorities, the higher the multiplier. 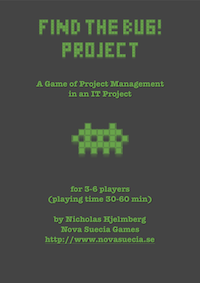 When a number of projects equal to the number of players have been delivered, the player with the most victory points wins. Recruit: Take one project member card. 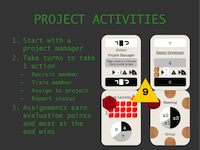 Train: Flip one project member card to its senior face. Assign: Assign a project member to a project. The project member gets an ”achievement” depending on the contribution to the project (time, cost or quality). The project gets a ”budget post” (time or cost). Report status: Return all assigned project members. Then place a ”seat" between two steering group cards. The quality of the project (the number of bug free tasks). The budget compliance (actuals vs budgets for time, cost and quality). The steering group priorities (multipliers for time, cost and quality). The challenge of Find the Bug! - Project is to build a team that is best suited for the tasks while also manipulate the steering group priorities to earn the most victory points.